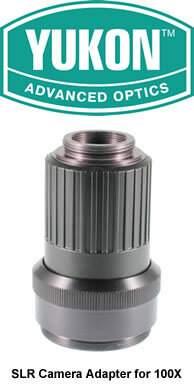 A relay lens adaptor that allows SLR 35mm and Digital Cameras to be attached to all variants of the 100X Spotting Scope. The unit replaces the standard eyepiece, which unscrews. An additional T-mount adaptor (M42 x 0.75) is needed to fit the adaptor to individual camera mounts - available from all good photographic retailers. Please note that there will be no metering connection between the spotting scope and camera body. Fits models 21031 100X, 21031S 100X Silver and 21032 100X LT Silver.